Stepper Motors work under a very similar principle to DC motors, except they have many coils instead of just one. 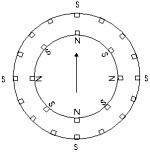 So to operate a stepper motor, one must activitate these different coils in particular patterns to generate motor rotation. So stepper motors need to be sent patterned commands to rotate. These commands are sent as high and low logic over several lines, and must be pulsed in a particular order and combination. Steppers are often used because each 'step,' separated by a set step angle, can be counted and used for feedback control. 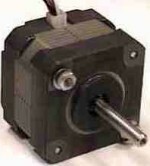 For example, a 10 degree step angle stepper motor would require 36 commands to rotate 360 degrees. However external torque can force movement to a different step, invalidating feedback. Therefore external torque must never exceed the holding torque of a stepper.